Bamboo Flooring is certainly one of the upcoming materials in today's floor market. With many many advantages over traditional hardwood flooring it has certainly been a kind of shooting star amongst the different new floor types used. Amongst many its durability and hardness make bamboo very resistant. With a very short rejuvenating cycle of about 5 years bamboo can be harvested much faster than most softwoods. Softwoods usually have a 20 to 30 year harvest cycle. But keep in mind that bamboo is better compared in a review to hardwood than any softwood or pine flooring. Being cut, dried and than glued together in panels, bamboo flooring can be distinguished into two different types. Vertical and horizontal grain bamboo. 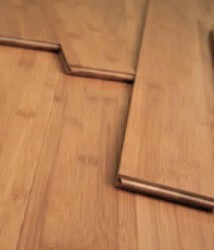 Bamboo flooring vertical grain, shows very fine grain lines. Bamboo flooring horizontal grain, shows a wider line of grain. As always, as a general rule of thumb here as well, wide large rooms and you might go for horizontal grain whilst on smaller spaces you may choose the fine vertical grain bamboo flooring. Basically when it comes to how to install bamboo flooring, the installing procedure is pretty much the same as with conventional hardwood flooring. If you use solid bamboo flooring you will need to consider that your surface is particularly dry - especially when you install it onto concrete surface. Make sure you read all installing instructions from the bamboo flooring manufacturer carefully, because humidity can backfire if it comes to any wooden floor installation. Also make sure that you store the packages with your bamboo flooring for some day in the room you want to install it, so the floor adapts properly to the temperature of the room. Again watch any how to install bamboo flooring tips in the instructions of the packages. Any Special Tools Needed ? Each method used depends widely on the surface underneath and the recommendations of the bamboo flooring manufacturer. Depending on the method you will either need a special glue or a flooring stapler or ordinary PVAC flooring glue. To sum it up, with its hardness and durability bamboo flooring is certainly an alternative to any common type of wooden floor. Combined with its positive ecological aspects, every woodworker should consider bamboo flooring for certain projects.